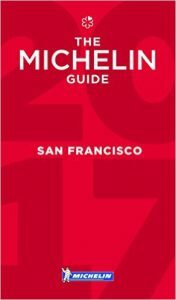 New 2019 Foodie bible Michelin San Francisco Bay Area & Wine Country Restaurants 2019 was released on 11/29/2018. This sells for $14 at Amazon. Manresa – Los Gatos – Finally an upgrade to 3 stars. $303 Tasting Menu. Quince – San Francisco – Raise prices, remodel, finally hit 3. Best service in SF? Single Thread Farm – Healdsburg – New – Must go! The Restaurant at Meadowood – St. Helena. $359 Tasting Menu. How about some non tasting menu 3 star restaurants? Acquerello – San Francisco – Surprising. We’ll have to revist, never believed they’d get 2. Commis – Oakland – Getting more expensive..
Lazy Bear – San Francisco – Surprising. 1 star is more like it. Fun dinner party. Aster – San Francisco – Surprising newcomer – Also Borderline 1*. Auberge du Soleil – Rutherford – They were wowed by the killer view. Commonwealth – San Francisco – Finally there are here. Kin Khao – San Francisco – Hmm. Borderline 1 star. La Toque – Napa – Doesn’t belong up here! Madera – Menlo Park – A stretch for 1*. More of a power scene. Mister Jiu’s – San Francisco – A Shocker.. Doesn’t deserve to be here. SPQR – San Francisco – A bit too high, perhaps Bib only. State Bird Provisions – San Francisco – Hype city, but good! The Progress – San Francisco – Innovative. Deserves it! Wakuriya – San Mateo – A sleeper that is hard to get reservations for. Chapeau! – We’d consider it for one star. Coqueta – San Francisco – I think it will cost you more than $40. Cotogna – San Francisco – This can easily cost more than $40! Delfina – San Francisco – One star in our book! Hong Kong Lounge II – San Francisco – Can’t believe it, it is not that great. Orchard City Kitchen, South Bay – In a Casino! Ramen Gaijin, Wine Country – How about Santa ramen? Royal Feast – Millbrae – Overrated! Sichuan Home – San Francisco – Hmm? Why? Sushi Ran – Sausalito – Deserves 1 star? wonderful, Millbrae – Hard to believe. Chinese very regional food. Yank Sing – San Francisco – Expensive. How about R&G Lounge? Many places removed are not considered in the future as we’ve seen very few re-instatements. Chez Panisse dropped off several years ago, but really deserves at least 1 star. The Cafe is a great value. Maruya – San Francisco – Too bad the chef just left. Perbacco – Deserves 1 star. Add Barbacco to Bib Gourmand.